Those who follow Oregon’s wines can be forgiven for missing out on the State’s non-Pinot Noir bottles, such is Pinot’s dominance of the market. In sheer dollar terms, in 2015 Pinot Noir was responsible for $1.1 billion in sales while all of the other varieties combined accounted for just $55 million. But that doesn’t mean that Oregon’s wine producers are throwing in the towel on anything that’s not Pinot Noir from the Willamette Valley. Far from it. In fact, the quality of wines made from “outlier” varieties has never been better, as my recent visits to the area and tastings in New York have confirmed. Given the moderate, ocean-influenced climate that influences Oregon’s wine-growing regions, it isn’t surprising that grape varieties from historically cool European wine regions have found a comfortable home in the Beaver State. Outside of the Willamette Valley, the Rogue Valley in southern Oregon may have the best potential to catch the wine-buying public’s attention. But that comes with a caveat, namely that what looks to be the most exciting variety there is Syrah, a grape that has had a difficult time catching fire in the wider American market for years now. That’s not hard to understand, in my opinion, because Syrah in its most classic produces savory wines, with fruit often playing a secondary role to herb, spice and even game character—in other words, just about the antithesis of the silky red fruit character that makes Pinot Noir so viscerally appealing. Owing to the wide range of methods used to produce Oregon Chardonnay, I believe that it’s far more difficult to define a “typical” style for the variety here than for Pinot Noir. While the vast majority of Pinots are aged in small French oak casks of varying age, Chardonnay is made and raised in stainless steel, concrete, wood and even clay vessels, and in some cases all of those vessels are used to make a single bottling. Individual producers often make Chardonnays in a variety of guises—say a stainless steel non-malolactic version and a full-blown, barrel-fermented, full-malo rendition, and sometimes something in between those two stylistic extremes. The best Oregon Chardonnays, unsurprisingly, display distinct Burgundian character and these wines are made in a fashion similar to their Old World role models. Also unsurprisingly, most of the best examples are being made by winemakers who are from Burgundy, were trained and educated in the region, or at the very least have spent and continue to spend time there. While only a handful of Oregon’s Chardonnays can compete with the best of California to this point, the top examples are indeed among the very best Chardonnays I’ve had from the New World and, in fact, are as good as many highly regarded white Burgundies. Among the best examples of Oregon Chardonnay, and there are a number of them, I highly recommended those from Bergström, Lavinea Single Vineyard Wines, Arterberry-Maresh, Walter Scott, Ponzi, Stoller, Eyrie, Amalie Robert, Big Table Farm, Domaine Serene and Domaine Drouhin. I also quite like the often off-beat, Old World versions made by Johan Vineyards and Brick House. Pinot Gris is a distant second to Pinot Noir in terms of total acreage under vine in Oregon (13%, vs. 62%) but for the time being is holding steady. It might be surprising to some that this variety was planted in the Willamette Valley at the same time as the first Pinot Noir vines were—in 1966 by David Lett at Eyrie in the Dundee Hills—so its history here is rich. While a few producers are pushing the envelope with Pinot Gris by producing skin-contact “orange” wines or full-blown, barrel-fermented renditions, sometimes with a touch of residual sugar in the style of some well-known Alsace producers like Zind-Humbrecht, most examples of Oregon Pinot Gris are made in a graceful, energetic style. Unfortunately, overcropping and early harvesting have, over the years, resulted in too many dilute wines that may be brisk and refreshing but lack the concentration and complexity to hold an experienced wine lover’s attention for long, if at all. The finest versions of Pinot Gris, however, can be among Oregon’s very best white wines. Those original vines that were planted at Eyrie still produce a truly outstanding wine but the production is pitifully low. Made with care and attention to detail, rather than simply for commerce, Pinot Gris has the potential to be a star in Oregon, but until a critical mass of producers takes the serious path the variety’s image will be dictated by the reasonably well made but just as often anonymous bottlings that currently dominate the category and public perception. Among the most consistently outstanding Pinot Gris bottlings I would count Eyrie, Chehalem and Cristom, and all of those wines age gracefully, if one is so inclined. This variety is proving to be a real success story in Oregon, from a qualitative if not quantitative standpoint. With only 724 acres under vine, Riesling’s overall quality level in the state is quite high, with many more hits than misses. In fact, I would argue that Oregon can give New York’s Finger Lakes region a run for its money in elegant, vibrant Riesling, but unfortunately these wines can be hard to find thanks to a highly loyal client base in the home state. Generally speaking, the best Oregon Rieslings are grown in the Willamette Valley and, to my palate, the most impressive ones are the dry, minerally versions such as those made by Brooks, Chehalem and Trisaetum, three producers who are deadly serious about the variety and who have steadily been building serious fan bases among sommeliers at top restaurants across the United States. Oregon’s Riesling producers are a tight-knit group and they have put an admirable amount of time and effort into getting the word out on their wines. They regularly host seminars on the variety, usually with the attendance of international producers of the variety, and, based on my own conversations with the participants at such events, their wines invariably make a positive impression. Riesling fans who appreciate the variety in a nervy, vibrant style really owe it to themselves to explore this category. Often planted along with Pinot Gris in Oregon, as has long been the case in Alsace—and, long ago, in Burgundy as well—Pinot Blanc can be a confusing shape-shifter, not unlike Pinot Gris. Depending on the producer, it can be a lean, racy, citrus fruit-driven wine if raised in stainless steel or neutral oak or a lush, exotic style if fermented in barrel and aged in oak—or just about anything in between. A few old Pinot Blanc vines can still be found in the Willamette Valley, notably in the Freedom Hill vineyard, whose fruit is the source for St. Innocent’s often outstanding and relatively obtainable rendition (production is about 1,000 cases per vintage). However, the variety is in decline, acreage-wise, probably because the wines don’t hold the cachet of Pinot Gris for most consumers, much less the star power of Pinot Noir. In addition to St. Innocent I would seek out Eyrie’s version of Pinot Blanc, which is a consistently outstanding wine. This is another variety that is on the decline in Oregon, with plantings down from 237 acres in 2014 to 213 in 2015. Gewürztraminer can be a real love-it-or-hate-it variety given its naturally exotic, even flamboyantly aromatic character, which encompasses the full fruit basket, florist shop and spice rack. That’s the style that most Oregon versions of the wine have expressed over the years but I much prefer the more graceful iterations made by Anam Cara (their late-harvest bottling is also a knockout) and Ovum, although production of those wines is small. 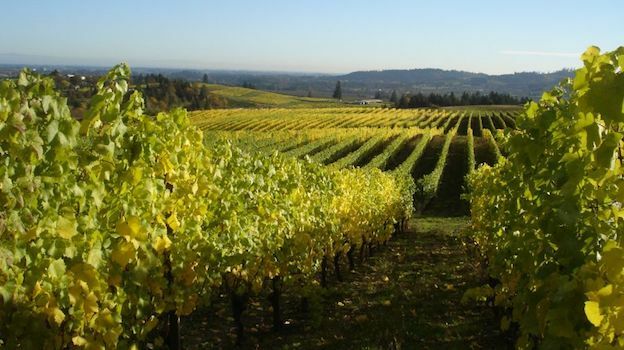 As the number of Oregon Viognier bottlings has increased (even though plantings actually dropped from 257 acres in 2014 to 241 in 2015), so too has the overall quality of the wines. In the past, too many bottlings were dull and tired, with early drinking mandatory. Many others were the polar opposites of these flat wines, showing shrill, high-acid character due to underripe or overcropped fruit, while still others were subjected to brutal oak treatment that masked varietal aromatic character, which is what Viognier is really all about. Virtually all Oregon Viognier is planted in the Rogue Valley, in the southern part of the state, and with rare exception these wines are produced with a light hand to better showcase the variety’s exotic perfume. They rarely veer in a vulgar direction, a fault that many Eurocentric wine lovers believe—and not without some justification—plagues most New World bottlings of this variety. When oak does come into play it’s almost invariably in the form of neutral barrels that allow for some oxygen interaction without introducing any obvious wood character, which is definitely to the good. Unlike the best examples of Condrieu, though, it’s the rare example of Oregon Viognier that rewards cellaring. My advice for drinking these wines, with the possible exception of Cristom’s bottling, which actually comes from their estate vineyard in the Eola-Amity Hills, is the sooner the better, while the fruit and perfume are still vibrant. Cowhorn Vineyard & Garden is a star producer of the variety, as are Cristom and, in many vintages, Penner-Ash. Quady North is an up-and-comer whose Viognier is worth searching out as well. With a whopping 114 acres now planted in Oregon, Sauvignon Blanc is one of the more obscure varieties here that’s actually on the upswing (only 73 acres were recorded in 2014). The best-known site for the grape is undoubtedly the Croft Vineyard, located in the southeast sector of the Willamette Valley. Andrew Rich does an especially good job with Sauvignon Blanc and his rendition has long been a reference point for Sauvignon in Oregon for many people, this critic included. The vast majority of the State’s Sauvignon Blancs are made in stainless steel tanks in a racy, Loire-inspired style—unlike in California, which has made a name for itself by referencing Bordeaux, with barrel fermentation and blending with Semillon often yielding outstanding results. Given the success of so many Sancerre producers who have Sauvignon Blanc planted side-by-side with Pinot Noir, it makes perfect sense that a similar symbiosis could occur in the Willamette Valley, but for now that’s still in the realm of fantasy, at least on a large enough scale to be noticed outside the relatively small world of wine fanatics. Patricia Green Cellars does an excellent job with Sauvignon Blanc and the wines deliver great value as well. Wines made from Grüner Veltliner, Grenache Blanc, Melon de Bourgogne, Muscat, Müller-Thurgau, Marsanne, Roussanne, Auxerrois, Malvasia Bianca, Vermentino and Chasselas make appearances in this article, and in some instances they are excellent. In most cases, however, these wines are mostly of academic interest only given the minuscule quantities that are produced. I have become increasingly enthused by Oregon’s performance with Syrah, especially because so many of the wines are being made with a strong nod to the northern Rhône. Whole-cluster fermentations are mostly the rule here, and many of these wines show the cool, spicy, floral character that distinguishes some of the Rhône Valley’s best examples of the variety, especially those from Côte-Rôtie. As I mentioned earlier, the Rogue Valley is producing most of the best examples of Syrah, and a number of the Willamette Valley’s best Pinot Noir producers have been buying fruit from the Rogue Valley in recent years as they expand their own winemaking repertoire, often with noteworthy success. Wine lovers who appreciate the elegant Syrahs of California’s cooler regions are strongly advised to hunt down and try some of Oregon’s versions, as they bear a strong resemblance to their southern neighbors’ bottlings and prices are generally fair. I’d definitely be on the lookout for Syrahs from Cowhorn Vineyard & Garden, Cristom, Gargantua and Quady North, all of which are personality-filled wines that will please even the most die-hard Rhône fanatic. Oregon’s first Gamay, which arrived via California, was planted (actually grafted onto Gewürztraminer vines) in 1987 by Amity Vineyard’s founder and owner, Myron Redford, on a two-acre parcel of the Seven Springs vineyard in the Eola-Amity Hills AVA in the Willamette Valley. As in Burgundy, Gamay plays second fiddle to Pinot Noir and simply doesn’t get a lot of love, or even attention, from producers here. But those who take the variety seriously tend to do a very good job with it, as evidenced by the numerous successful bottlings that I’ve tasted over the years from, especially, Brick House, Belle Pente, Bow & Arrow and Chehalem. All told, there are only about 30 known acres of Gamay planted in Oregon/ For comparison’s sake, Chénas, the smallest cru in Beaujolais, covers just over 700 acres. So, yes, Oregon Gamays are rare. Working with Gamay in the Willamette Valley is definitely a (costly) labor of love as Pinot Noir planted on the same sites commands far higher prices and benefits from a large, thirsty market. So, looking ahead, I don’t expect many new plantings of the variety. That’s a shame because the wines can be delicious, and in many cases they can stand up proudly next to many serious cru Beaujolais bottlings for aromatic complexity, depth of flavor, vivacity and balance. But they don’t come cheap (and the land where they grow it in Oregon isn’t getting any less expensive) and they obviously aren’t easy to find, but for adventurous wine lovers they’re definitely worth a look. Cabernet Sauvignon is currently planted to 630 acres, Merlot to 461 and Cabernet Franc to another 162 in Oregon. Almost all of these vines, along with parcels of Malbec and even smaller bits of Petit Verdot, are located in the eastern part of the State, in the Columbia Valley, which Oregon shares with Washington. While I have encountered a handful of stellar Bordeaux-style Oregon reds in recent years, their number pales in comparison to those of Washington, which has steadily been staking its claim as a highly dependable source for world-class renditions of these varieties, either as varietal bottlings or as blends, à la Bordeaux itself. Soléna Estate has been doing a solid job in the category over the years and the wines are definitely worth looking for. Amalie Robert, one of Oregon’s premier Pinot Noir producers, make a wonderful example of Pinot Meunier from their own vines but production is limited to around four barrels per vintage, making it a literal drop in the State’s wine bucket. Pinot Meunier is planted here and there throughout the Willamette Valley and while I cannot determine exactly how many acres are planted in total, I do know that it’s less than 80, because any grape whose acreage falls below that number is lumped into the “other varieties” category in the State’s grape census. And the vast majority of that tiny quantity of wine winds up in sparkling wine blends. So for now at least, Pinot Meunier’s potential is still unrealized. Compared to the other outlier varieties planted in Oregon, Tempranillo isn’t doing so badly, with 414 acres planted in 2015, up from 344 in 2014. I wish I could report that Tempranillo is showing great promise here but, as is the case with the variety pretty much everywhere outside of Rioja, Ribera del Duero and Toro in Spain, along with the Douro Valley in Portugal, it mostly comes off as pretty anonymous. This most Iberian of grapes just doesn’t play well away from its home base, which I also think is generally the case with Nebbiolo and Sangiovese when they stray too far from their Italian roots. Grenache, Tannat, Blaufränkisch, Mourvèdre, Primitivo and Trousseau also make cameo appearances in Oregon, and in this article. But, much like the handful of still-obscure white varieties mentioned above, these red wines are made in tiny quantities and are difficult to find outside the State. There’s even some Zinfandel scattered about, although I rarely come across the wines. I have found many of these “other” red varieties to be outstanding and worthy of tracking down, on their own merits as well as for the chance to get a glimpse of Oregon’s potential for a wine life beyond Pinot Noir. Please note that the vast majority of wines reviewed in this article are from the Willamette Valley and from the warm 2014 and 2015 vintages, years that tended to produce forward, fruit-driven wines. For more in-depth information on these two vintages, please refer to my recently published article on Oregon Pinot Noir.